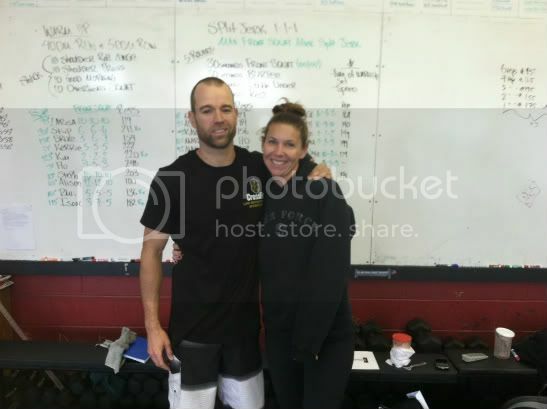 Ruedi and Lori all the way from Crossfit 760, Mrs. Michele Mootz's new gym. Now you all have plans next time you're in the 760! Power. It is a crucial variable to understand if you are to train the Olympic lifts effectively, because that is what they are all about, generating power. It is not required to know how to equate power output, but it can help to understand the concept of power and Olympic lifting more thoroughly. Power is directly proportional to force (weight of the bar [for simplicity purposes that is all we will consider in determining force]) and distance (in this case the distance the bar travels), e.g. as weight and/or distance increase so does power. Force (F) multiplied by distance (D) equals Work (W). As work decreases, power decreases. Time (t), the last and most important variable in the power equation, is inversely proportional to power, e.g. as time decreases power increases. If that did not make sense, here it is more practically. Johnny and Bill are the same height, and are power cleaning the same weight (F and D are the same for both of them). Johnny takes 0.7 seconds to complete the lift and poor Billy biceps curls the bar and it takes him 1.5 seconds. They both moved the same weight the same distance and Billy sure looked powerful curling that 225#, but who generated more power? Who is going to benefit? Obviously Johnny because he moved the same weight the same distance faster. The point is, it's about training movements the way they are intended to be trained so we can benefit from them. In this case with olympic lifting, the movements HAVE TO BE FAST. If you throw a max weight on there because you think (don't really blame you) that is what will make you stronger at that lift, you will not move yourself or the bar fast enough, decreasing your power. On the other side, if you do not have enough weight on the bar (not saying super light skill days aren't ever beneficial), you will not be doing enough work to stimulate a favorable adaptation (for another day) and your power output will be too low. This is why olympic lifts are usually trained around 80% 1RM. It is enough weight to drive power up, but not too much that speed cannot be generated. It also turns out that crossfit, and all the movements done in crossfit, are based on this equation. See a connection? After each split jerk do a max front squat.